Indian meals usually consist of several dishes and dal is very often one of them. Spiced lentils cooked until soft, and eaten either as part of a full Indian meal or just with some Indian breads, are very nutritious. Dal is also a very cheap dish to make, ideal when you want something tasty and filling that won’t over stretch the budget. This is a simple version of dal but an authentic Indian recipe. You could add more spices to make it more complex if you prefer, but they aren’t necessary here, as it is already well balanced with just enough heat. Chop the garlic and chillies quite finely. Cook them in the oil for two minutes then add the spices, stir well for one minute. Add the chopped tomato and cook together until the tomatoes are soft. 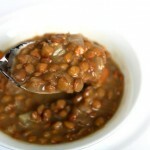 Add 1 cup of water and cook for about 25-35 minutes until the lentils are soft and tender. Check whether more water is needed halfway through cooking as different lentils absorb different amounts of water. You want to end up with the lentils having absorbed most of the liquid and spicy flavour, so don’t add too much extra water, just enough to stop them sticking to the pan. 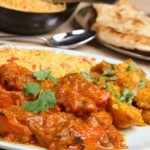 In the mood for something more complex in the way of Indian food? Browse the menus of our listed Indian restaurants in Sheffield for inspiration and eat out tonight instead.